Watch: Is this Mongoose Playing Dead or Just Playing? March 03, 2018 - These mongoose pups were wrestling when a hornbill appeared down the road. While hornbills have a mutualistic hunting relationship with adult mongooses, they have also been known to eat vertebrates the size of these pups. 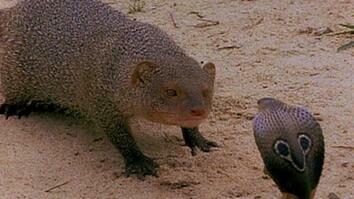 The bold mongoose pups don’t seem to have any fear of this potential predator. Lynda Sharpe, a behavior ecologist, says that mongooses will lie on their backs to invite another mongoose to wrestle. 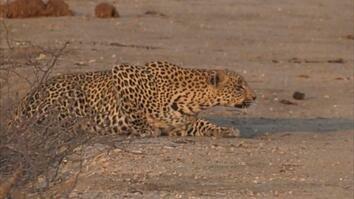 While it may look like it's playing dead, the mongoose is most likely trying to lure the hornbill to play. Both behaviors are incredibly novel … and also incredibly funny. These mongoose pups were wrestling when a hornbill appeared down the road. While hornbills have a mutualistic hunting relationship with adult mongooses, they have also been known to eat vertebrates the size of these pups. The bold mongoose pups don’t seem to have any fear of this potential predator. Lynda Sharpe, a behavior ecologist, says that mongooses will lie on their backs to invite another mongoose to wrestle. 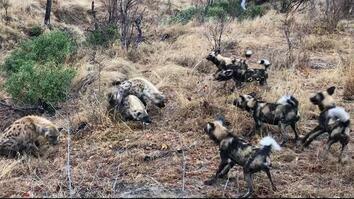 While it may look like it's playing dead, the mongoose is most likely trying to lure the hornbill to play.